Nancy Adams is Librarian for the U.S. District Court, Northern District of Georgia. Previously Nancy was Senior Reference Librarian at Georgia State University College of Law Library where she lectured on Georgia legal research. 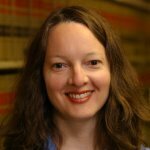 She co-authored articles on Georgia legal research for the Georgia State University Law Review in 1994, 1998 and 2006. Nancy was Electronic Services Librarian at the GSU Law Library from 1990-1998 and has also worked professionally at several law firm libraries in Atlanta and Boston.